Fr. Fabio Motta, PIME, confers with local youth in Guinea Bissau. 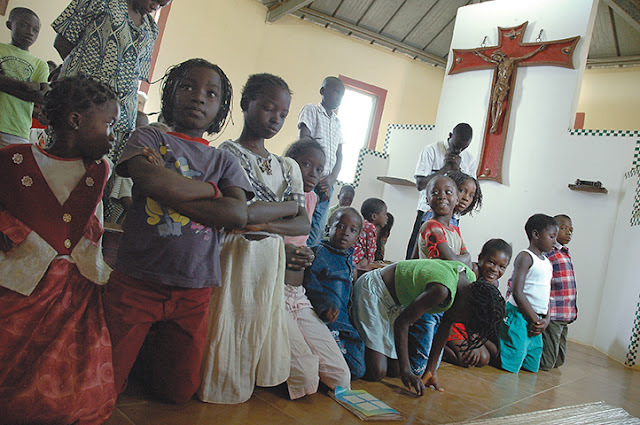 Pope Francis calls upon even the young Church in countries like Guinea Bissau to be outgoing witnesses of Christ. Guinea Bissau seems very far from the Vatican. However, the gestures and words of Pope Francis are leaving a deep mark there as well, guiding this young Church of Africa. It was one of his first expressions; which then became almost a refrain in his messages, homilies and speeches. 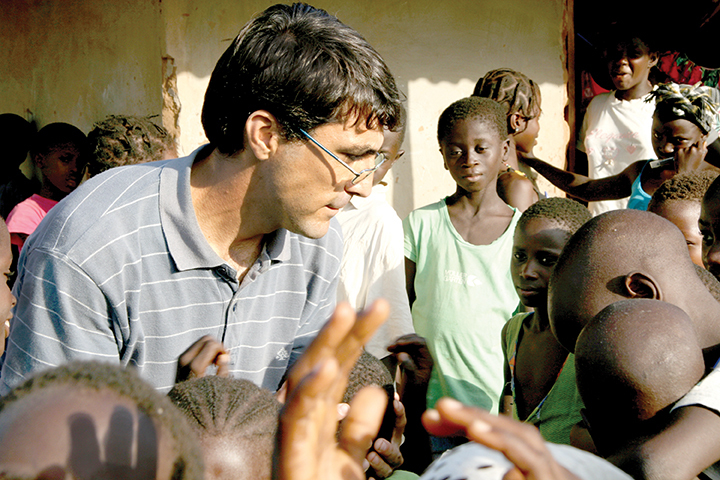 I immediately took it as a program for our little parish of Catió: in the south part of Guinea Bissau. I wrote it on a poster and glued it to the wall inside the church. Nobody noticed it on entering, and the Sunday Mass continued as usual until the moment of the final blessing. It was at that moment that I asked all of those present to turn around and stare at the church door. 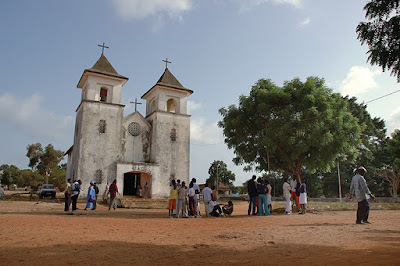 The poster with the inscription was right there: “Uma Igreja em saida” – “An outgoing Church”. 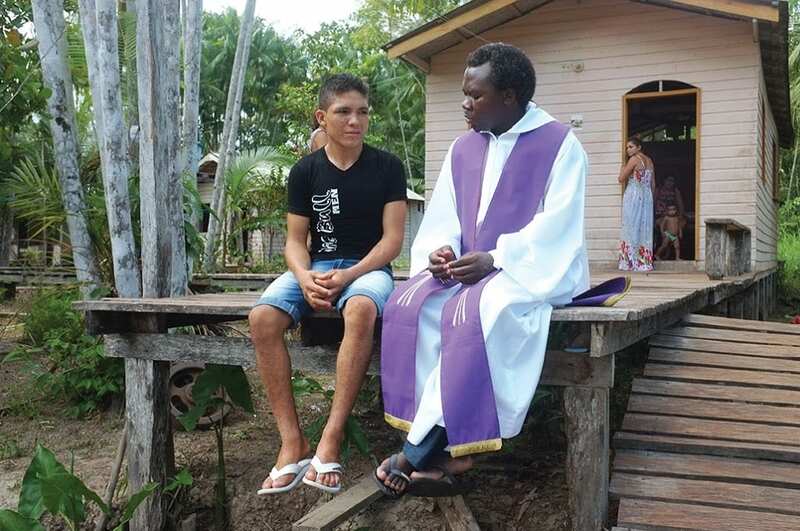 So, this is how we entered the pontificate of Pope Francis: I, as a young parish priest and the small community of Catió, a “periphery” of the world, to borrow his terminology. Viewing these words from here, they seem to glow of a special light. It doesn’t matter how big the community is, how much history and tradition it has behind it, or how many resources it has. The Church, in any corner of the world, is such that if it has the courage to reach out, it can do so; this is how I interpret the appeal of Pope Francis, captured its originality. The very “periphery Churches” are called upon to reach out, and not to feel as if they are at the receiving end of the Gospel proclamation. It is so precisely because they are placed “at the center” and they must become aware of other Churches at more distant “peripheries”. The genuineness of the Christian experience is at stake. This is how a Church keeps herself young, because she always regenerates herself. In a country, such as Guinea Bissau, where the Muslim population is greater than the Christian one, dialogue is an important part of being a witness of Christ’s teachings. Starting from that Sunday, that writing has served as a reminder for all those who participate in the Eucharist and return to their homes and villages. As for me, a priest, to celebrate with those words visible at the back of the church is to find the right criteria for the announcement of the Word and the mindset of breaking Bread, every time. The Good News is in fact always to be shared, and that Bread is “given for many” every time. Upon leaving the church, how can we accompany our community on her exodus? I said to myself: “Would it be by being in front guiding as a shepherd who leads his flock?” Well, here is another of Pope Francis’ surprises, which forced me to rethink my stance. In his Apostolic Exhortation Evangelii Gaudium, speaking of the mission of a shepherd, the Pope says that, yes, “Sometimes he will be in front to show the way and support the hope of his flock,” but, then, he adds that “other times, however, will simply be among everybody with the his simple and merciful proximity “and he even concludes that “in some circumstances he will have to walk behind the people, to help those who are trailing in the rear and above all because the flock itself has its own sense of smell to identify new paths.” It is with this image that I have revised the style of my missionary activities, placing within me a dynamism of service in which the flock determines the position of the shepherd. Not only that, but the flock is a source of inspiration and support for the shepherd himself: it can show him the right path to follow. I remember, in this regard, the curious faces of my people when the week following the election of Pope Francis I projected the YouTube recording from San Pietro taken by a Portuguese news network. Here in Catió, the Conclave and the announcement of the Habemus Papam had arrived only through Radio Sol Mansi and the community wanted to see and know this new Pope “come from the end of the world” and receive his first blessing, even if it was a little late. What struck the young Guinean audience above all? The moment when Pope Francis raises his hands and, before blessing the people in the piazza below, he bows to ask for the blessing of the people on him. A leader, an elder, who bows in the gesture of “leaning towards” the flock, here in Africa is something totally new. Once again, he “leans towards” the feet of inmates in the juvenile prison at the gates of Rome, a few days later for the ritual of the washing of the feet. Not in San Giovanni in Laterano but in a prison, not only for the Christians, but also the feet of Muslims. They are prophetic gestures more powerful than words. Gestures criticized by some, but in themselves full of so much light. In my mind emerges the desire to try to “reproduce” them in our little ways here, in this land, where the message is transmitted better with signs than with words. The words and actions of Pope Francis has gained traction in the hearts and minds of this “young” Church in Guinea Bissau. This is how the first initiatives came about to meet and visit with the leaders of the local Islamic community, as well as the reciprocal invitations to celebrations and recurrences of our communities. That, in turn, developed into sitting together and sharing the same table, and then being present together in moments of crisis and political turbulence to pray. It is in the wake of this approach that the desire to get to know each other more closely and to try to dialogue was born. Then, study days were started on common topics such as faith, Scripture, the law; where opportunities for giving time to listening to each other to increase respect and esteem, even in diversity, were created. I mentioned earlier about Pope Francis’s terminology and the power of gestures. How can we forget the decision to anticipate the opening of the Jubilee Year right in the African land, in Bangui, in the Central African Republic? A deviation from “the script” for many, but for Pope Francis an appointment he could not pass up: a clear message, rather than adherence to protocol. A calendar like that of the Pontiff often fills with unexpected events and unscheduled visits, a little like life here and in other mission lands. Finally, I cannot fail to mention the effectiveness of his words: his most simple and direct vocabulary. I remember, for example, the work done for the diocesan commission of catechesis on the occasion of the extraordinary Jubilee of Mercy. The manual prepared, and reprinted three times, contained the words of Pope Francis and the presentation of the works of mercy. 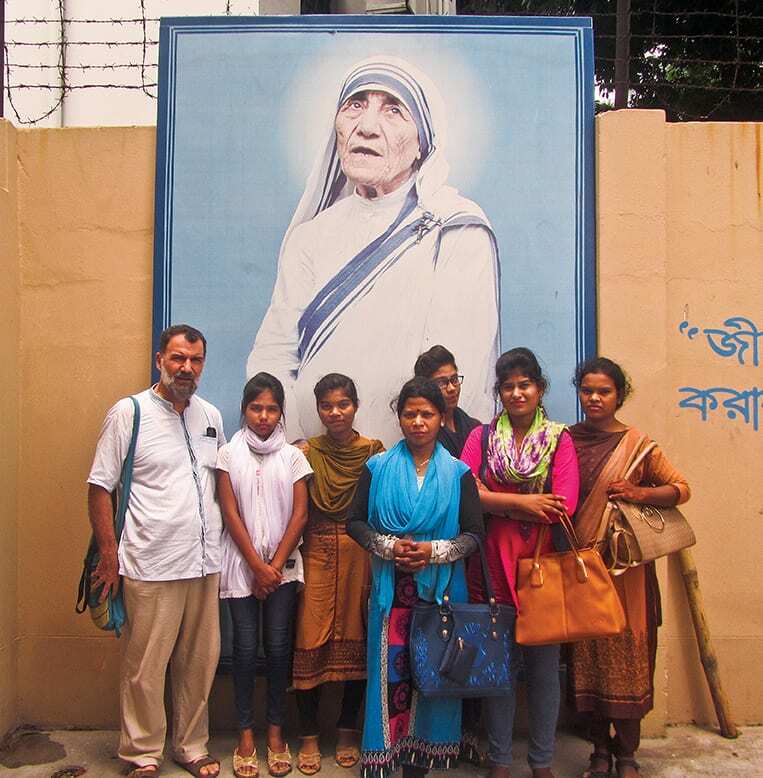 Language seems like a little detail, but for a missionary, who is often called to translate texts and the homilies of the Pope to the local language, the commitment becomes less burdensome while the message becomes more accessible to everyone. In Africa it is said: “The one who shows the way is a life-giver”. This is the caption of a picture of a seated old man who advises a young man, and who pours on him the wealth of knowledge about the art of living. Even Pope Francis, with his many “surprises” is showing, with gestures and words, the right path to us and to our young Church of Africa.